Sometimes what is popular on the blog and what is a flop surprises me. The most visited posts on my blog aren’t even project posts, it’s the followup posts I do a year or more later showing how a project or item has held up over time. I get why these are popular, people (myself included) don’t want to spend time and money on something if it’s not going to hold up. 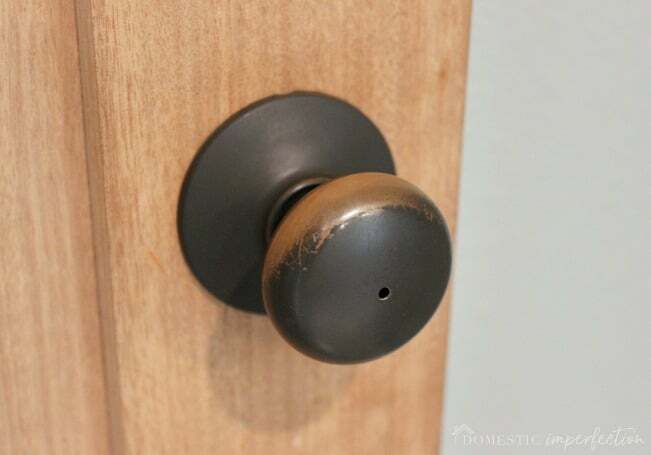 So today I have a followup post about something you may have been wondering about…oil rubbed bronze hardware. The door knobs that see a minimal amount of action look the same as they did a year ago. The ones that get touched the most are showing a bit of wear. There is one door though, the mudroom door that leads out to the breezeway and garage, that looks completely different. The wear on this one has made it through the brown stage, right past the orange stage, and is now in bright yellow territory. I’m guessing that in a few years a good percentage of our doorknobs will look like this, which I can’t decide if I’m okay with or not. I actually really like the wear when it peaks through as orange, but the bright brass yellow is a bit much. 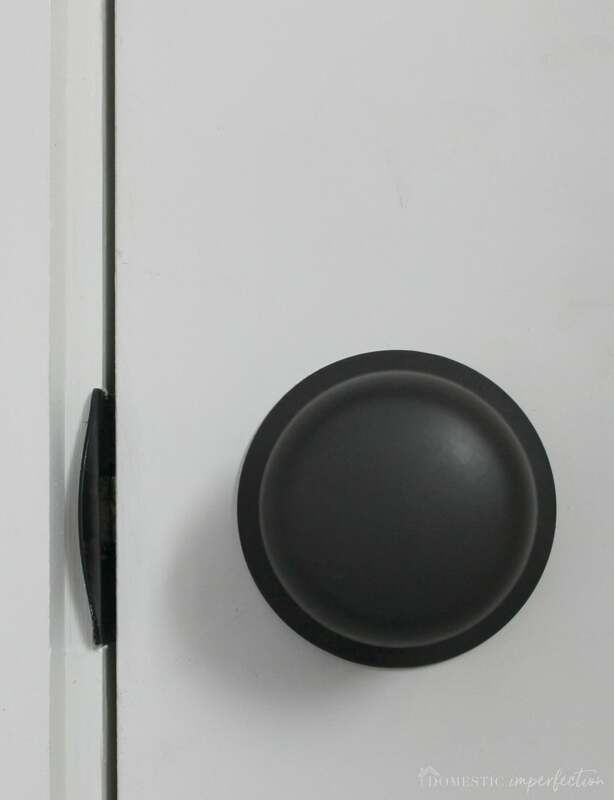 The knobs we chose (these, by Schalge) are less than $20 each and function beautifully, so I may just throw a new one on the mudroom door every few years. Also, I can’t end this post without telling you about our keypad deadbolt. Adam and I designed and built our dream home, and out of all the things I love about our house, this $99 item is at the top of the list. I’m not even kidding, this deadbolt and our crazy amazing dishwasher are tied for making my life easier. No more keys, no more fumbling around in the dark with my hands full of four kids trying to get the door open. Family and friends know the code, the kids know it, and it’s just super convenient for everyone. These keypad deadbolts can get pretty fancy (with apps and alarms and all that) but ours is bare bones and works for us. I highly reccomend getting one…keys are so 2008. 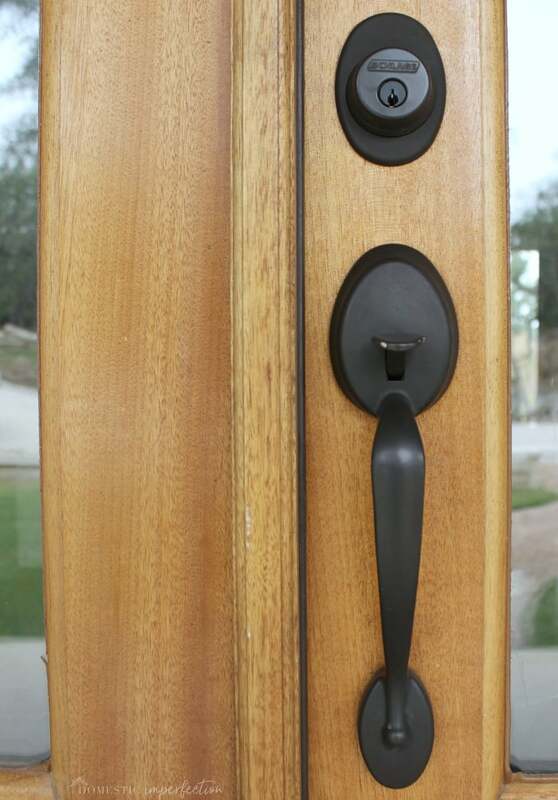 Anyway, that is how our door oil rubbed bronze hardware is wearing… hopefully this information makes someone’s decision easier! I wonder how that would work if I sprayed my door hardware oil-rubbed bronze myself? I’ve been considering doing that. Have you heard of people spray painting their door hardware? I can only imagine that keypad would be a godsend. It’s like the button to open the car locks – by far my favorite feature among our very limited number of features on our car. 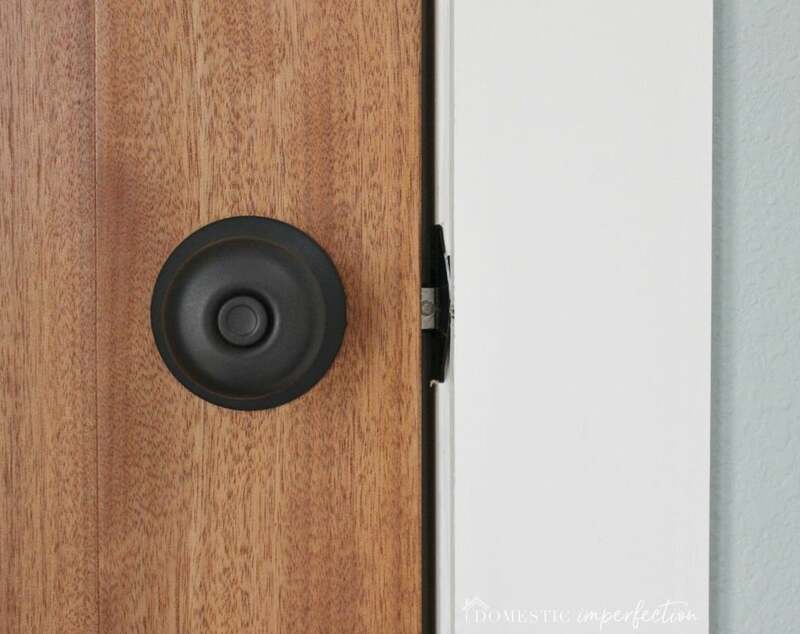 I have heard of people spray painting their door hardware with great success, here is a post one of my blogger friends wrote about that exact thing – http://www.livelovediy.com/2012/08/update-old-doorknobs-with-spray-paint.html . I have spray painted several of my door knobs, and I found they hold up best when covered with a clear coat over the bronze. We bought out house 4 years ago and all the hardware was oil rubbed bronze. It looks the same today and it did when it was new, so the type/brand must have an effect on wear too. Do you know the brand of your hardware? It makes sense that brand would matter, though I figured they would all wear at least a little. 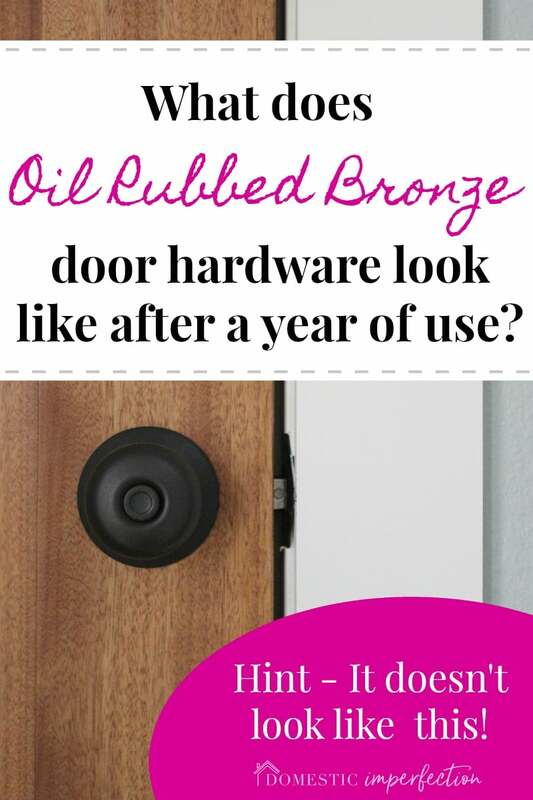 I bought some of my hardware from Amazon and some from Build.com, and before I checked out at Build.com a rep contacted to me make sure I knew my oil rubbed bronze hardware would change over time. I’ve had ORB handles for about 5 years now and they aren’t even close to looking like that. 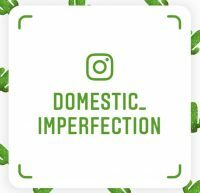 Our most used ones simply got shiny, but no finish differences. Could be that we got the cheapie house brand from Lowe’s and it’s not actual painted metal? Who knows, but making the change from a contemporary nickel to the ORB was one of my favorite decisions. This post couldn’t be more timely–we are shopping for new outside door hardware tomorrow night! I want the keypad lock for the door we use the most (carport). My question, though, is: Is it easy to change the combination on these? I have a different combination keypad on my door from the garage to outside, and it’s pretty easy to change. (I have to look up the instructions each time, but it’s not complicated, and if you did it frequently, you wouldn’t have to look it up.) 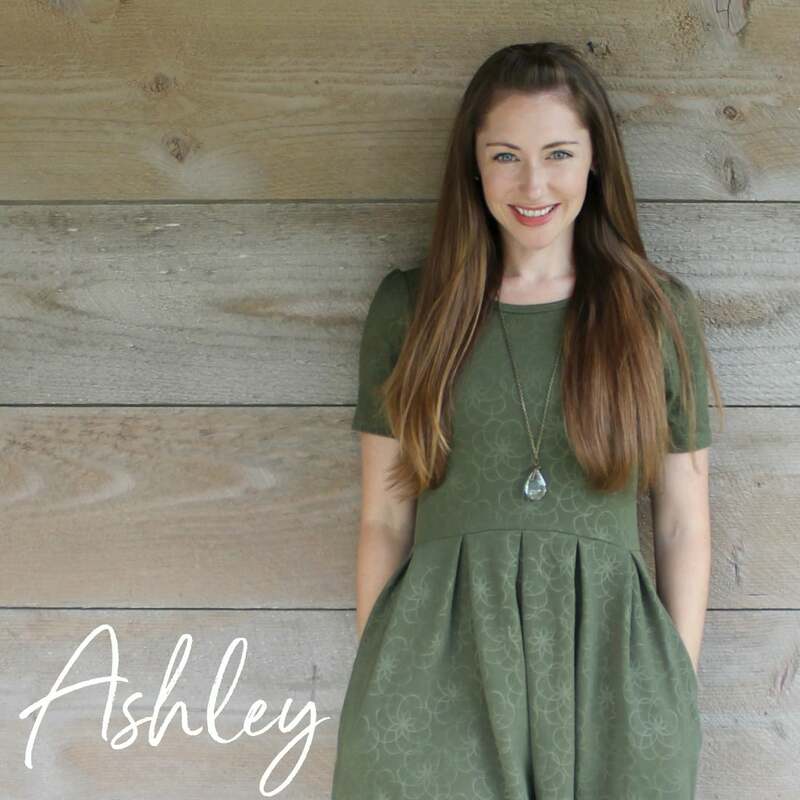 I will say, though, that the battery needs to be replaced about once a year, and I didn’t get the kind Ashley has because of a fear of a dying battery locking me out. Mine (don’t remember the brand) has a lever that you have to turn after you’ve put the combination in, so a weak battery will still disengage the lock but doesn’t have to actually turn it (since I do that with the lever thing). Hope that makes sense. 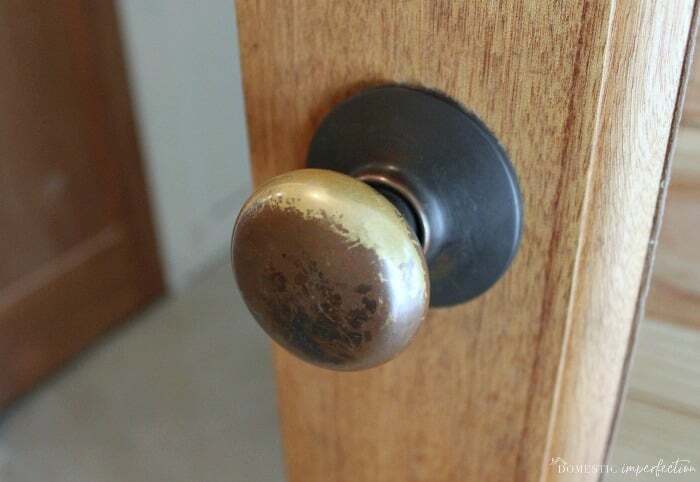 We moved into a new-to-us house in June… And that is exactly how the doorknobs look. We couldn’t figure out why. 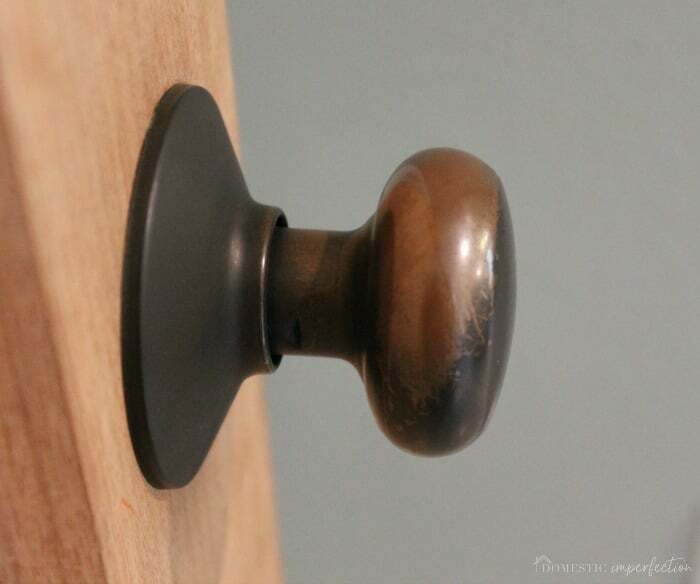 Now, thanks to your post, we are pretty sure that our knobs are oil rubbed bronze. Thanks so much! We have had a keypad lock on our house for many years–just a basic model similar to yours. I love it. I never need to worry about finding keys, or making sure the kids have keys. If someone needs to get in when I am not home I can give them the code over the phone, and then change the code if needed. 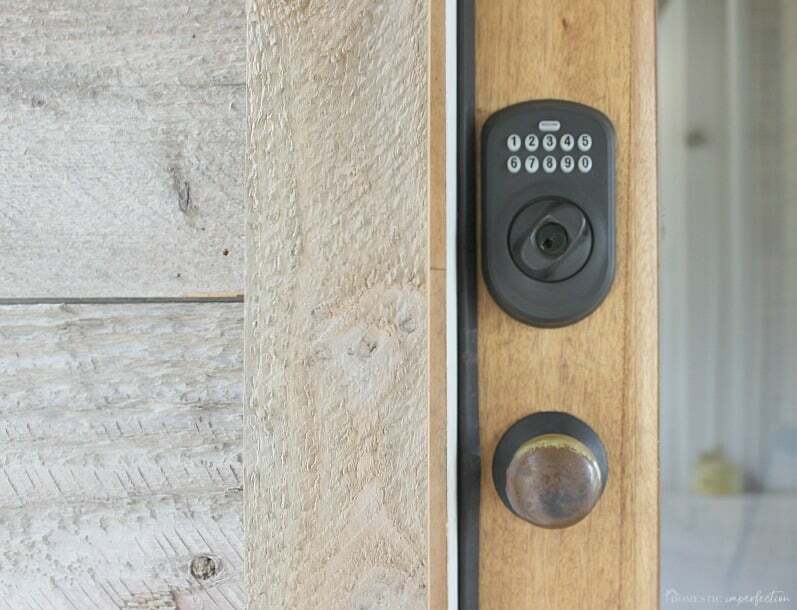 We put in a keypad deadbolt and we love it! The buttons light up if you touch the pad making it easy to see. Plus, we will never have the problem that we had when we got stuck in traffic 8 hours from home – with our dogs crated and locked in because the thoughtful house sitter had left the key behind when he left – thinking that we would be back in 4 hrs. If we need to let someone in, we can just give them the code (or their own code) and it’s easy to change if you ever need to. I had a contractor coming today to measure for door/window trim and I also had to pick out doors and hardware. I was really leaning towards ORB finish but after reading your post, I decided on aged bronze as it won’t wear off. I’m not crazy about the ‘forced aged’ look but it seems like the better choice for us. Thanks for the posting, it’s so helpful to see how things like hardware hold up over time. You could also spray it with oil rubbed bronze every few years. It works great and you can’t tell. Wow, thank YOU for showing this. I was about to enter my card info on some ORB cabinet pulls. Now, I’m not so sure. I’m going to have to research this as I would not like it if this happens on cabinet pulls too. It’s for my kitchen, which is the center of the house and is seen from the entry. Thank you.